Recently I had the pleasure of reacquainting myself with a producer whose wines I used to drink regularly, and for whatever reason moved away from… Cristom Vineyards from Willamette Valley. 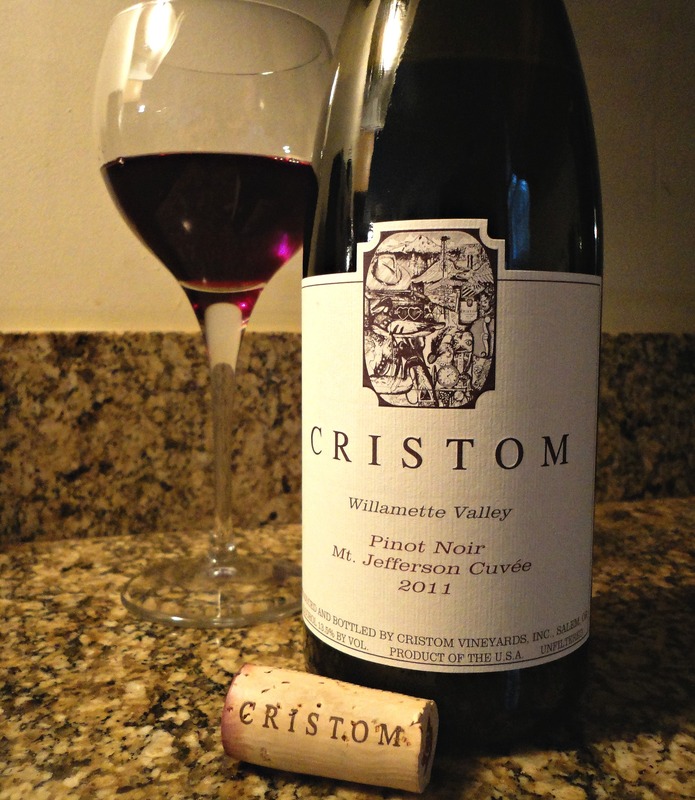 For a number of years Cristom was my go-to Pinot Noir when I wanted something good, quite good actually, but not too rough on the ‘ole wallet. Not necessarily what you would consider “every day” drinkers for most people, but not “sticker shock” inducers either. Someone gave me a bottle of their 2011 Mount Jefferson Cuvée the other day, and it immediately put a smile on my face, kind of like unexpectedly bumping into an old friend on the street. So let’s talk about the wine. The Mount Jefferson Cuvée was first produced in the 1994 vintage as a blend of juice from Cristom’s six estate parcels, and that’s how it still stands today. The wine is composed predominantly from younger vines or barrels that were good, but didn’t quite make the mark to be included in the Cristom single vineyard wines. That is not meant to be a knock… Any given vintage there are barrels that are extraordinary, ones that are very good, and others that are good. So for the barrels that are simply “good”, they don’t warrant going into the $60 bottle of wine, but they’re great to be incorporated into a $25-30 bottle! In the glass you find a medium bodied wine of dark garnet hue, bordering on purple, with slight transparency. In the bouquet are aromas of bing cherry and macerated strawberries, with subtle hints of lavender, dried garden herbs and cola. The palate is lively and diverse, with notes of dark cherry, ripe strawberry and tart raspberry, accompanied by nuances of rhubarb, black tea and white pepper, framed by moderate acidity and soft subtle tannins, leading into a finish that is surprisingly warm and lingering considering the 13.5% alcohol. While the wine sees 11 months élevage in barrel, only 11% is new and its presence on the palate is negligible, typical for most Willamette producers of worth. As far as food pairings go… I know that many times Willamette Pinots are a perfect match with salmon and scallops, but I don’t necessarily see that here. Possibly if they’re being served with pomegranate and fresh herbs, or a sauce that is a fruit or wine reduction. Instead I would gravitate towards roasted duck or squab, filet mignon, and surprisingly I find that it would also pair quite well with lamb accompanied by mustard seed or mint. This could also be a great wine for Thanksgiving dinner as it’s just delicate enough for turkey, but will stand up to the side dishes, even stuffing with sausage. Or just forget the food and drink it by itself! Overall the wine is exactly what the Cristom trio are shooting for… varietally correct and representative of it’s appellation. 2011 was a difficult vintage in the region and this is a wonderful effort given the circumstances. As I always say, quality winemakers make quality wine regardless of the vintage. I feel that the wine is price appropriate, but for this particular vintage not necessarily over delivering for the price, as many previous vintages have done. I am sure that the 2012 will be a different story, assuming the prices remain the same. Tags: cristom, mount jefferson cuvee, oregon, perfect pairings, perfect pairings at home, pinot noir, willamette valley, wine. Bookmark the permalink.